A few weeks ago we were flipping through an issue of Kraft Food & Family and stumbled on this recipe...we thought it looked super yummy, so a few days later we gave it a try, and man are we hooked! Super simple, ingredients I typically have on hand (except maybe the pie crust - until now!) - one of those desserts that's nice to have up your sleeve in case you unexpectedly have company or need to take a dessert somewhere. This has become a quick & easy go-to dessert for us...in fact we took a few to Thanksgiving & it got rave reviews...wouldn't be surprised to see it make a guest appearance at Christmas either! Hope you'll enjoy! I used 1/3 less fat philly and it worked super great too - I also used my Pampered Chef apple peeler-corer-slicer & it makes the bulk of the "work" to make this recipe just disappear - I know it's a kitchen gadget, but I highly recommend it! We left the skins on, and just used it to core & slice the apples and it worked wonderfully! HEAT oven to 450ºF. Line 9-inch pie plate with crust. Carefully spread cream cheese in 6-inch circle in center. BAKE 25 min., covering loosely with foil for the last 5 min. Cool. Serve with COOL WHIP. Refrigerate leftovers. Give this one a try and let me know what you think! 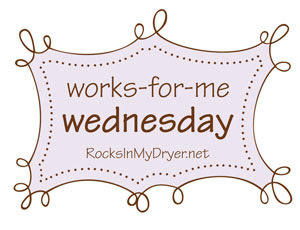 For more great WFMW ideas, head on over to RocksinmyDryer!